With the Canon WP-DC35 waterproof case for the Canon PowerShot S90, you can use your digital camera to take underwater shots at depths of up to 130' (40m). Of course it's also ideal for taking worry-free pictures in the rain, at the beach, or on the ski slopes. You can use your camera's internal flash for lighting purposes. Or, use the internal flash to trigger a slaved external strobe like those made by Fantasea, Sea & Sea, Ikelite, or Sealife. The camera has an underwater white scene mode for available light photography. Box Dimensions (LxWxH) 6.3 x 4.5 x 4.2"
WP-DC35 Case for Canon PowerShot S90 is rated 4.6 out of 5 by 48. 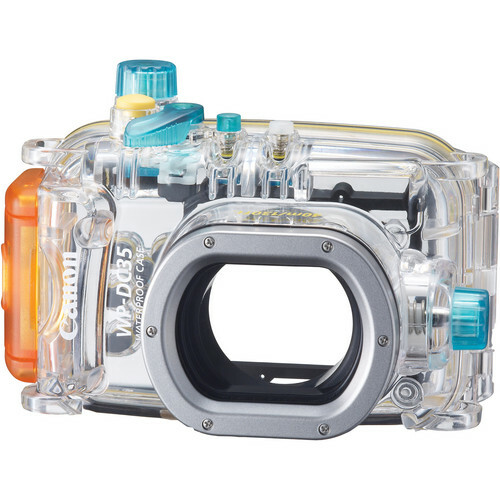 Rated 5 out of 5 by Anonymous from Perfection Underwater To my knowledge, this is the only underwater case for the Canon S90, and I'm glad it's the only one. There are no negatives about this case. The seal is perfect and it really keeps your camera protected underwater. All buttons and functions are fully accessible and functional even underwater. Pictures come out crystal clear as if the camera doesn't have a case around it. If you are going to be snorkeling or diving up to 150 ft, this is the best way to capture your experiences. Recommendation: Please do not buy the disposable water cameras that are sold in shops, the image quality is horrible and not even worth using. Rated 5 out of 5 by Anonymous from Definitely worth it! I picked this up just before leaving for the Big Island. ... The case provides excellent protection and is is very easy to use. A quick greasing of the seal (takes a few seconds), kitchen sink test for water-proofness, set the S90 to underwater mode, and we were off. Our snorkelling photos are simply stunning -- lots of oohs and aahs from Facebook friends! We've taken it kayaking with great results. This afternoon we are going jet-skiing and will again bring along our brilliant S90 in the safety of its WP-DC35 case.I've purchased half a dozen of those cheap-o underwater film cameras over the years, with consistently awful results. This case is da bomb. Rated 4 out of 5 by nice79guy from Great weatherproof case! I rushed this for my caribbean cruise and it sure did not disappoint! I didn't get a chance to scuba or snuba, but did test it three times snorkeling without any leaks! Clearer and better than a waterproof pouch. Easily accessible buttons even though the nobs are not positioned comfortably. Didn't bother with the buying the weights and don't regret it. My biggest issue was during a rainforest hike, the rain stains were prominent on the lens window and showed up on a lot of pictures. Aside from the cost, this is a great case and allowed me to shoot 70% of my pictures had I not brought the case! Talk about saving the day, let alone memories to cherish! Rated 5 out of 5 by Anonymous from Exactly what I needed I wanted something to waterproof my fun camera for sailing trips and river rafting. I haven't taken it under water completely, but it's really done the trick to provide that extra protection when I take it on the water. I really love it; it does exactly what it's supposed to, and I'm very happy with it. I will be using it a lot! It's true you can't turn the wheel on the backside of the camera, but I just made sure to set my camera before putting it in the case so I wouldn't really need to. I also recommend cleaning the lens cover any chance you get; I had some pictures turn out with a big water droplet. Rated 4 out of 5 by Suit 'n Flip-Flops from Good case - worked well for the $ This is a basic case for the camera. If you want truly good underwater pictures, you'll need a more advanced and expensive set-up (e.g., external flash) but for the money, the pictures were surprisingly good. Note that one cannot control the wheel on the back control panel using the case. I took the case down to 55 m (180 ft) without any issues. Rated 4 out of 5 by Anonymous from Performed swimmingly! I used the DC35 case on a trip to Huatulco, Mexico, on several snorkeling excursions. I didn't go any deeper than about 10 feet, but the case performed very well, and gives me a versatile, relatively small system that provides the best of the S90 out of water and protects it well in adverse conditions. The only major drawback is that you can't spin the control dial on the back of the S90 with controls on the case, which means that, for example, changing the manual focus point is not possible once the camera is sealed in the case (at least I haven't found a way to do it). That said, the other controls are easily accessible via the case, and it appears to be very solidly constructed. If you intend to use the case for both under- and above-water photos at the same time, make sure to have a lens-safe cloth with you to wipe water drops off the front glass element to avoid water blob spots in your above-water images. This isn't a fault of the case itself. What is the maximum temperature supported for this case ? I know is discontinued model, but can I use it on low temperatures for diving (max depth 18m but temperature between 2 and 4C) ?